2:43:06 PM: A hawk and a squirrel engaged in a turf war above my head as I walked in downtown New Haven. 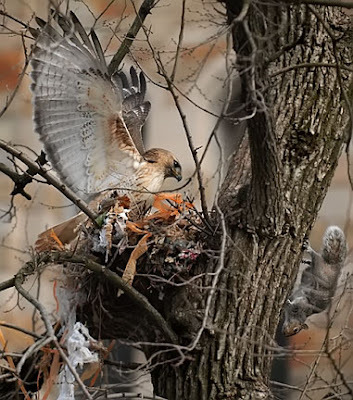 After circling the tree several times and destroying a nest, the hawk reluctantly flew away. perfect timing on this shot - i love that you captured the hawks full wing span, excellent work! great pictures as always johnny! When are you going to give your best friend some of your pictures? Hmm maybe for my birthday coming up next week? I really like all of the new york pictures you took with the pigeons and the tree photos. I am one of your biggest fans I deserve some of your work!